Blurb- A young and vivacious girl, Raahi is all set to live her dream in a big city. A cruel twist of fate and her world starts collapsing around her. Aadit, a business analyst in New York, is effervescent and full of life. Or at least that's what he shows to the world, but deep down he is still struggling with his own demons. The fate interweaves their lives together and just when a bond is about to bloom, life throws another curve at them. They start drifting apart completely oblivious to what fate has in store for them. The Twist of Fate is a heartfelt and enamored tale of the entangled emotions of love that promises to keep your eyes glued to its pages. 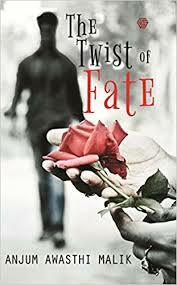 Review- The Twist of Fate is romance fiction authored by Anjum Awasthi Malik. Author has good story telling skills but the not-so-unique plot makes this book an average read. Language and Narration- Author has its own narrating style which i am sure readers will find easy to follow. Language is simple and easy to comprehend. Theme- Theme of this book is not new. Although writing style of Anjum and neatly portraited characters keeps you glued with the book. All together The Twist of Fate is old wine in new bottle with Anjums' Writing Style and beautiful portray of characters. I would recommend this book to all the romantic fiction readers.